Is there any doubt left that wearable technology, sooner rather than later, will become an essential part of keeping track of our health? One needn't have a mysty crystal ball to see that that's where things are headed, and, given enough will on the part of manufacturers, it seems pretty certain that those wearables will be tightly integrated with our smartphones. Indeed, companies like Samsung have already begun prepping for this expected new age of health and fitness tracking, and its S Health suite has been going through an improvement after improvement. S Health can now track your heart rate, your blood oxygen saturation, calories consumed and burned, and many, many more. 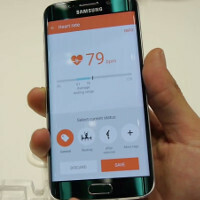 With the Galaxy S6 and S6 edge, which also brought forward a new version of Samsung's TouchWiz, we now have an even more refined version of that same S Health suite. Sure, this time around we're talking mostly about a visual refresh, but that's actually not at all an unimportant detail. We took a quick look at S Health on the Samsung Galaxy S6 edge earlier today, so it's time for you to get comfortable and let us demo it for you. See Apple? This is innovation. None of that gimmicky bulls**t Apple attempts to spread. Its the other way around this is the type Bulls**t people dont need or use. id use it when i workout if i had a smartwatch but sadly non of the smartwatchs have caught my eye accept for the lg watch urbane lte but its not running android wear so i don't want it. speak for yourself, or maybe post a selfie to go along with that comment so we have some context. At least Samsung has a fitness wearable. I like fitbit but this new interface actually looks a little nicer in some areas than fitbit. As long as you can expand any of the graphs to see the weekly and monthly data visualized as well. I've always liked apps with the live heart rate trace to understand if data is streaming in properly or if it's got too much noise or gain. The article talks about blood oxygen but I haven't seen how such data is collected. I use S health daily as I train 2-3 Hours every day. I check my resting heartbeat through my Gear S, I check it during heavy cardio activity, and check my steps every day. I find S health to really be of great use, especially when you are disciplined enough to keep up with your daily activity( As a professional athlete I am constantly watching calorie intake as well as downtime). This is exactly why I love that they added S health to the fold. Moral of the story: Just because you don't like it, doesn't mean there aren't 100 more people who do. They don't make products based on JUSTwhat Kishin wants..
That's a stupid thing to say... anyhow s health on my S5 revolutionised my training! That's a stupid thing to say... anyhow I just want you to know, s health on my S5 revolutionised my training! Exactly ! Maybe not innovation but S Health offers a lot of things other apps can't offer in a single app. Even the paid ones are pretty lacking in features. Why it is such a big problem, you ask ? The thing is since other apps don't offer every health related info in one spot they can't exchange information within themselves to provide a better result. For eg S Health can keep count on my calories intake and also measure how much of it I've burned of it while walking all day. Normally you'd need to install a seperate app for walking/running and a seperate app for recording your calories or diet intake.